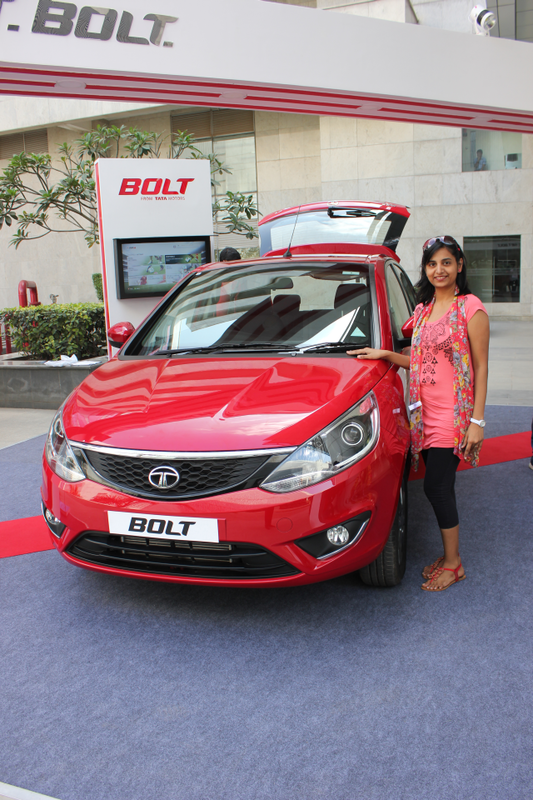 So, for my Car I have been hunting for pretty while and have developed this crush on the new Tata Bolt. It started with the name itself as I love athletes and things associated with them. Just like my real-life crushes, this one built slowly as I understood its features. I first started exploring about Bolt online. Read some really good views here on Team-BHP and many good reviews. Though I don't understand the technical specifications fully being a non-technical person in Auto industry, still when I discussed all the below features with my much enlightened friends, I gathered that I would be getting a great deal in a good price range. For it is available in India with a starting price tag of INR 4.44 lakhs for the base model of petrol and INR 5.49 lakhs for the base model of diesel. Being R.K. Laxman's common man, I understand a car by its looks, usability, comfort and on-the road performance. That only should matter to me, right? 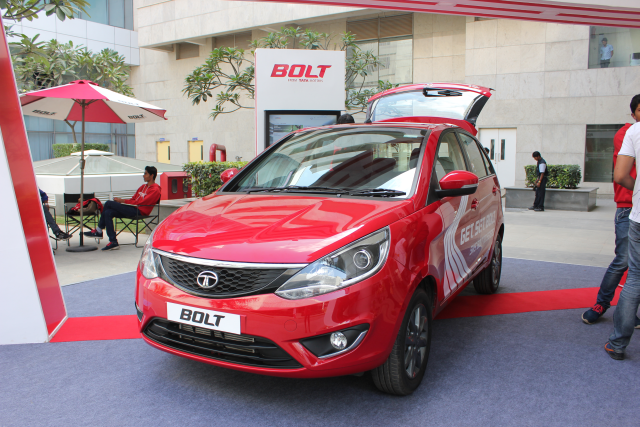 Hence, after confirming with my peers I visited the Bolt Arena near my place to have a look at the new sporty and dynamic hatchback created by Tata Motors, I asked the same from the people over there. 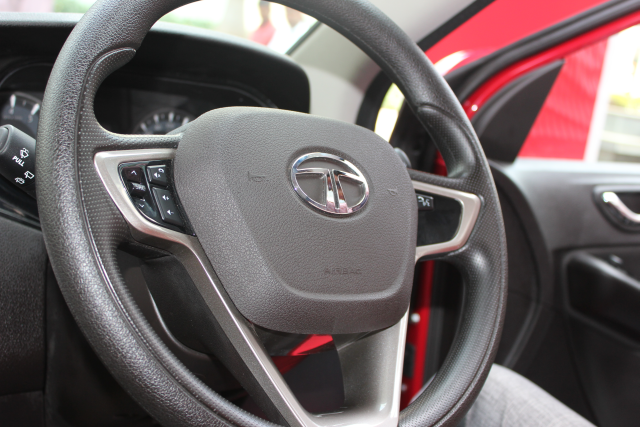 It has three modes to choose – City, Eco and Sport – to suit the driving conditions and my mood for the day. 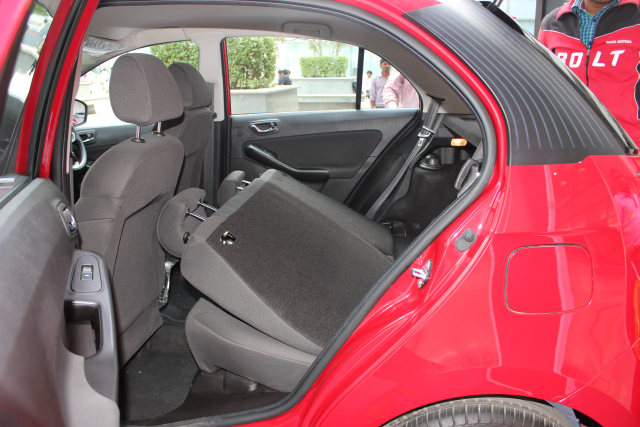 It’s good to see such stuff that I've heard only in expensive luxury cars come in to mid-segment hatchbacks. 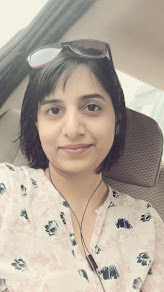 This will ensure that I drive efficiently when in famous bumper to bumper bangalore traffice or enjoy the ride when on nice roads like NICE road. Love at first sight? 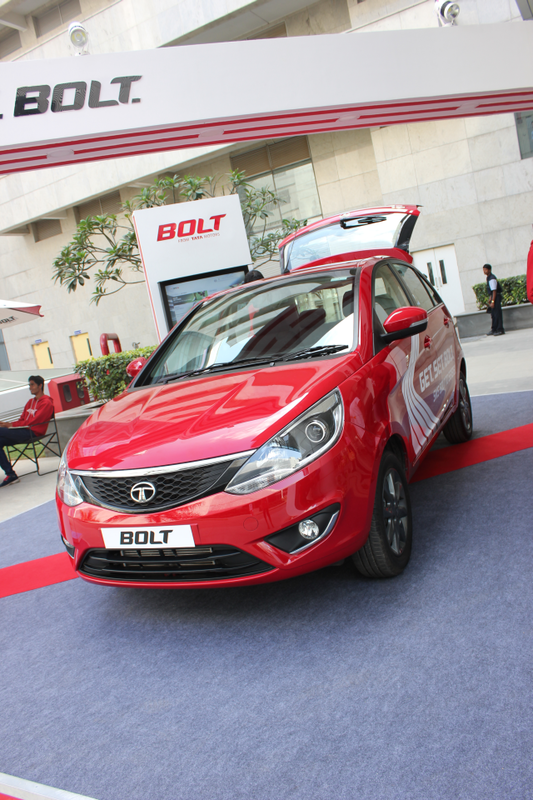 Tata Bolt turned out to be a well-sculpted body, with some remarkable exterior features and new body panels, fog lights with bezels, a new Tata signature front grille with the new Humanity Line which flows directly into its dynamic projector headlamps with chrome accents, stylish 15-inch alloy wheels, thick character line at its sides, integrated turn indicators, a sporty antenna at the front top, a rear automatic wiper, a floating rear roof spoiler and distinctive LED tail lamps. All this available in 5 different shades - Venetian Red, Pristine White, Platinum Silver, Dune Beige and Sky Grey. 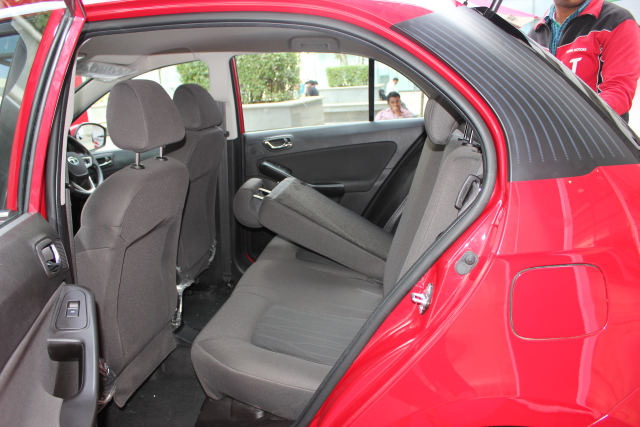 There is ample leg space, something which I need esp. that my daughter feels cramped if the space is less. Comfy seats and elegant and premium looking interior with all black-theme cockpit. 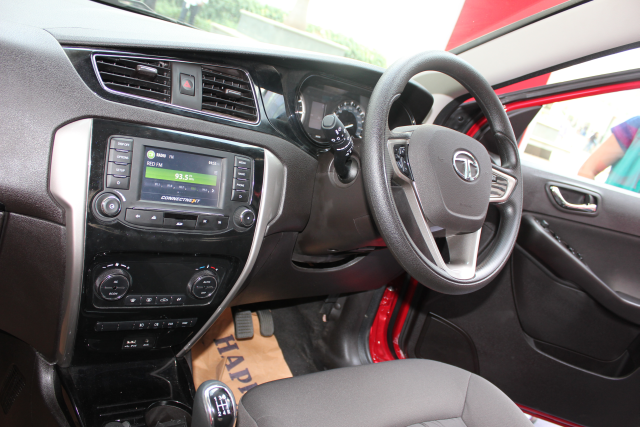 What more can I want than my car having HARMAN infotainment and audio acoustics system, MapmyIndia navigation and location based services and a 5-inch touchscreen supporting a superb multimedia experience. Bolt comes with an advanced Bluetooth technology, smart voice recognition, advanced smartphone integration, phone enabled navigation, social media integration, a touch phone controlled interface. I will be the most geeky mom to my daughter owning Tata Bolt :) I can play Movie in the Multimedia screen while waiting for someone, yay! 4. 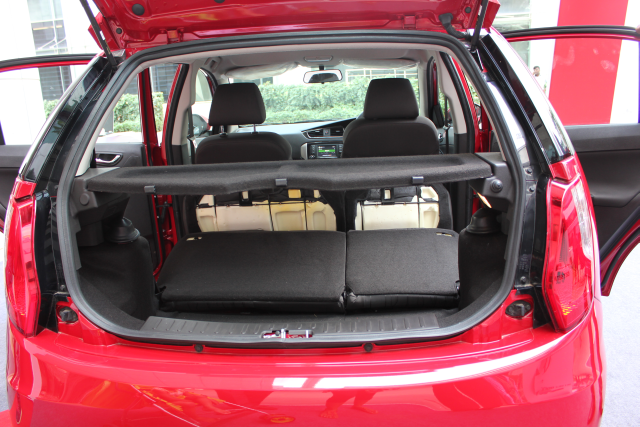 Foldable back seats: Till now I haven't seen a good family car with ample boot space but Bolt surprised with its intelligent back seats. For a small family with babies who wants to carry Pram and other baby gear along with luggage during travels, its a very good feature. 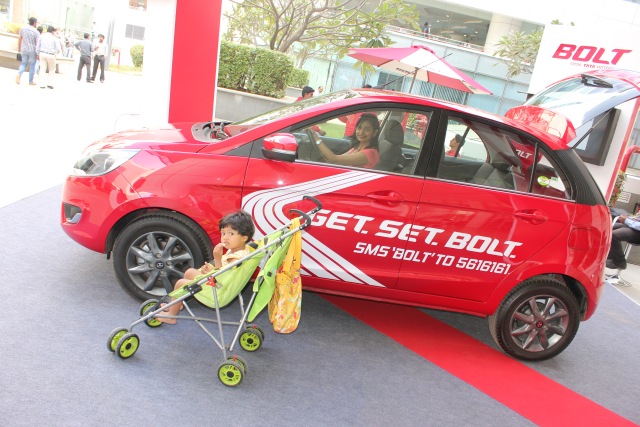 For a newbie like me in driving, I often get confused when to shift gears and Bolt has answered that with a simple yet remarkable solution. Its Car console has a gear shift indicator. Based on the speed it can indicate when a shift in gear is required. Already the steering is very light but this has taken half of my driving worries. 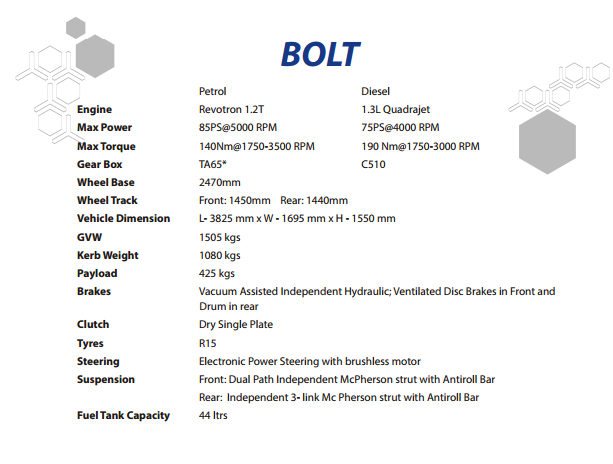 Bolt has also taken care of safety features as well that I would consider - anti-lock braking system (ABS), electronic brake force distribution (EBD), airbags for driver as well as front passenger, seat belt reminder, clutch lock system, parking sensors, anti-theft alarm, engine immobilizer, remote central locking, speed sensitive door autolock and anti-theft alarm. Overall, a more than value for money car. I am planning to get one for myself, how about you?? Goodluck with your new car, when you buy it. Looks powerful too. How did it feel to drive? Want to check it out sometime. This is as good a recommendation as one could write on a car. Hope you win...Good luck!